The following article from Elisha McFarland, writing for WakeUp World, provides information on what toxins are hiding in common materials found in your home, as well as helpful suggestions on how to create a non-toxic bedroom. Although the idea of detoxing your sleeping environment may seem overwhelming and cost prohibitive, if you approach it by biting off little chunks at a time, before long you will have eaten the whole enchilada and will be sleeping and feeling one thousand times better. (Elisha McFarland) Many of us understand the importance of consuming organic foods and making detoxification a regular part of our health routine. Creating a healthy home environment is also part of the detoxification/clean living process. After learning about the health hazards of dryer sheets and toxic cleaning products, you may have already eliminated these products from your home. But what about your bedroom? After all we do spend one third of our lives sleeping, yet often times this is the room that is neglected. Creating a clean (non-toxic) bedroom can be a financial challenge, so starting small is the easiest solution. Every change you can make will have a positive impact on your health. How you begin is a personal decision based on your budget and health issues. Some people begin with replacing their mattress, others an air cleaner or bedding. Replace or remove all artificial fabrics from your bedding. Start with pillows and pillow cases, gradually working your way through the sheets, mattress and bed frame (if it’s made from artificial products such as particle board or MDF, see suggestion #5 below). Many people make the mistake of assuming that cotton is a safer choice than synthetics, but the fact is that cotton uses 25% of the worlds insecticides and over 14% of its pesticides. 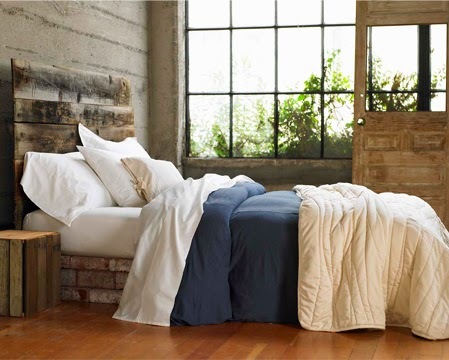 As you can afford it, replace your bedding with organic materials. The reality is that synthetic materials such as acrylic, nylon, and polyester are made from thermoplastics. These fabrics out gas plastic molecules whenever they are heated. If you wear wrinkle free clothes you’re breathing in plastic and formaldehyde. Remember that you also absorb these chemicals directly through your skin. The base for most synthetic fabrics is a liquid made from coal, oil, or natural gas. The liquid is forced through the fine holes of a nozzle, called a spinneret. As the liquid emerges from the holes, it is cooled so that it solidifies to form tiny threads. These threads are woven together to make fabric. To make these clothes more durable Perfluorochemicals (PFCs), including Teflon are added to fabric to offer wrinkle and stain resistant qualities. Look for clothing made of natural or organic materials. To learn more about synthetic clothes click here. If you have any furniture in your bedroom, such as a chair that is artificial leather, it shouldn’t be in your bedroom or any room in your house for that matter. You may be surprised to learn that Polyvinyl chloride (PVC), is often used in synthetic leather. PVC is widely regarded as the most dangerous of all plastics. It is made more flexible with the use of toxic plasticizers—typically phthalates, which are known endocrine disruptors. Throw pillows and seating cushions that are stain and water resistant have been sprayed with chemicals that are toxic. If the fabric is a cotton/polyester blend it was most likely treated with formaldehyde, and softened with ammonia. Replace these when you can with organic or natural material. Like MDF, particle board contains formaldehyde, a known carcinogen that has been directly linked to nasopharyngeal carcinoma (throat cancer) in people. The chemical can also cause headaches, allergies, nausea and a burning sensation in the throat. Look for solid wood furniture at furniture stores, flea markets and yard sales. Glass and metal end tables and desks generally work well as they don’t outgas and are easily wiped down. Wood or tile floors are easiest to clean and better options for allergy/asthma and MCS sufferers. While small accent or area rugs may look nice in your bedroom, they hold onto dirt, dust mites and other allergens. If you can, omit rugs and carpet. Almost all polyester is manufactured with antimony, a carcinogen that is toxic to the heart, lungs, liver, and skin. Many carpets are also made of olefin (polypropylene). Nylon, which is petroleum based synthetic fiber invented in the 1930’s by Dupont and is common in rugs. Consider making your home a shoe free zone. Have indoor and outdoor shoes to avoid tracking in pollen, dirt and chemicals from outdoors in. You can also purchase a shoe or boot tray to keep by your door. When you come in from outdoors simply place your shoes in the tray to minimize dirt, pollen, dust and chemicals from being tracked into your house. If you have a computer, TV or other electronic devices in your bedroom, you may consider moving them into another room. Electronic devices emit radiation that can disturb a peaceful night of sleep by disrupting sleep patterns. Switch out your digital alarm clock to a battery operated alarm clock. This is the most difficult step as it is cost prohibitive for many people. The reality is that conventional mattresses are sprayed with flame retardant and stain resistant chemicals. Many mattresses are made of foam that can outgas for years. There are many sources for organic mattresses at local stores and online. Wherever you shop be aware of green washing. If you can’t afford to replace your mattress, you may consider wrapping it in a foil barrier cloth available at www.afs-foil.com. They also sell a foil tape to seal the edges. I found the tape to have a strong smell, although it does evaporate in 3-4 days. If you are chemically sensitive, have someone else do this for you. If you can afford a whole house air cleaner, they are a wonderful investment. Do your research; there are a lot to choose from. For many people a portable air cleaner that can be moved from room to room is a wonderful option. Look for one with HEPA filtration, and be sure that whatever you buy does not produce ozone. Some air cleaning companies will even custom blend their charcoal filters for specific needs such as allergy/asthma, smoke, MCS etc. Drapes and shades hide dust, pollen, and other allergens. If you can remove drapes and shades and replace them with organic fabric drapes and shades. If the cost is prohibitive, consider bartering with a friend who can sew curtains or drapes for you. Wood blinds may also be an option for some individuals. If you are building a new home or remodelling you may consider blinds that are in between the glass, no out gassing, and no weekly cleaning!